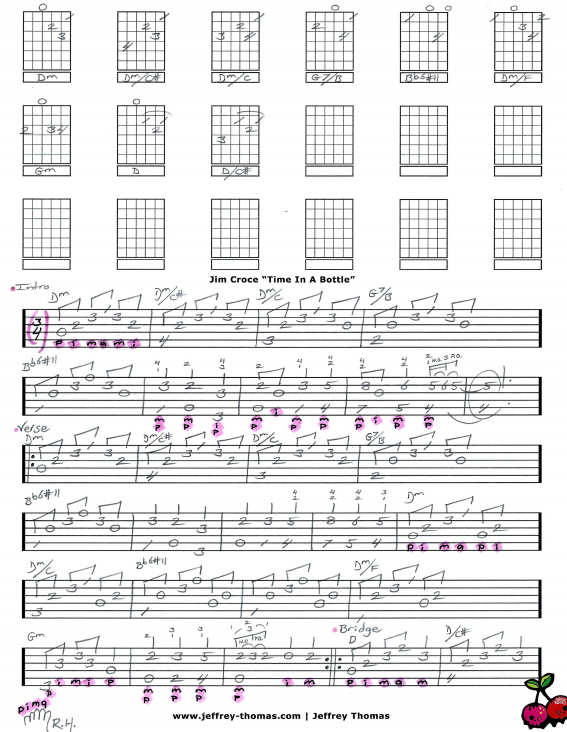 Jim Croce Time In A Bottle Free Guitar Tab by Jeffrey Thomas. Learn this classic fingerpicking acoustic song with my custom guitar tab arrangement following the original recording. Play the proper song structure, chords, fingerpicking details and solo. Let me know if your would like the full guitar tab arrangement for free? Just enter your email in the form provided and I will send it off to you. Many of my students are interested in the classic folk fingerstyle guitar songs. If you would like to improve on this type of guitar playing let me know. Fill out the Schedule A Free Lesson form and we can set up your free Skype guitar lesson today. “Time In A Bottle” was Croce’s second and final number one hit. Find more popular online guitar tabs on my tab, video and blog pages.